Exploring alleys in Cities and visiting old towns in the North Indian heartland has been a passion for me since my childhood. I visited Mohan [pronounced Mohaan], a prominent town of Awadh, which now falls in Unnao district, during a recent visit. Though most of the people whom I had asked about the town couldn't tell me about any famous structure or building known for its architecture in the town, I still decided to explore the town. The visit proved fruitful. Barely a few hundred metres inside this town, I could spot the huge minaret. Soon the domes were also visible. 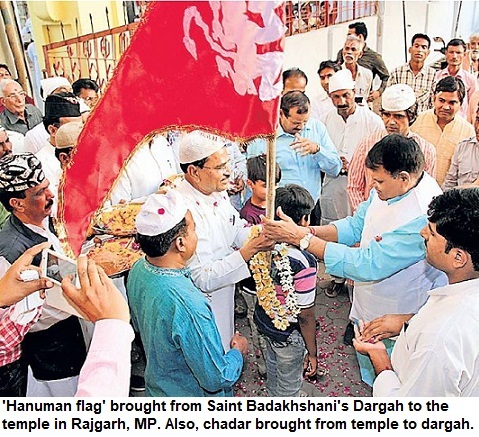 Locals told me that it was the 'Karbala of Mohan'. Though I have been to some Shia shrines, particularly, Imambadas in Lucknow, the imposing structure in the small town that has a population of barely 15,000 came as a surprise. The ancient structure that has an Imambada is not generally frequented by people. Not many outside the town are aware of the structure. The local residents also don't seem to realise that it much bigger [and architecturally refined] than similar buildings in many of the major cities including Muslim centres. I went inside and found a small staircase leading to the top of the minar. Rarely people venture up and thus the staircase had several lizards, bats and birds but I managed to climb to the top. It was a stunning bird's eye view from there. Amidst the vast green expanse and the mango orchards, the entire small town was clearly visible from the top. Almost every City and town has a place where Shias (and also Sunnis and Hindus) commemorate the martyrdom of Hazrat Imam Husain during the Islamic month of Muharram. Often the Karbalas are by the side of a pond or river where the 'tazia' [replica of the Imam's rauza] are immersed on Yaum-e-Ashurah. In small towns in UP, there are umpteen such structures. The photograph on the top left shows the 'Karbala'. You can gauge the height of the minaret by comparing it with the bus parked by its side. Residents said that it was constructed on the lines of a 'rauza' in Iraq. However, such architectural heritage lies unattended, unexplored and even unknown. As almost 80% of Muslim gentry from these owns had migrated after independence, the structure didn't had adequate upkeep. View from the top of the minaret. Mostly poor Muslims remained in the towns. The abolition of Zamindars had also hit the Muslims in the Indo-Gangetic belt. For a long time, people didn't have money and resources to run their own households let alone take care of such structures. 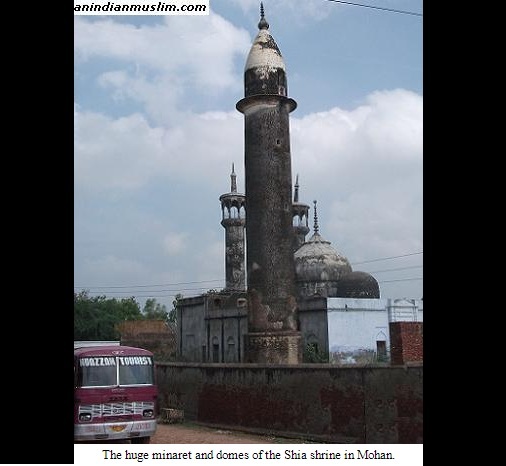 Mohan has a substantial Shia population and they run madarsas as well. Of late, it seems the situation has improved a bit. I found some other unique structures which have architectural and historical importance. About them, I might write in later posts. I had chat with owners and customers at the eateries at the gate of the 'Karbala'. A middle aged man, who introduced me as Pandit Ji, and runs the pan shop, also gave me some information. Unfortunately, I couldn't meet the caretaker of the shrine.